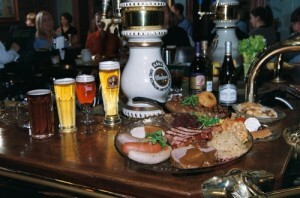 The Newportville Inn menu features both American tavern favorites and traditional German standards. From New York strip steak to our homemade crab cakes and from sauerbraten to schnitzel, we have something for everyone. Start out with potato pancakes or snapper soup and end your meal with one of our delicious desserts. Our menu changes with the season, so stop by and see what’s new.